This is a new improved version 3.0! The I2C-7SEG-V3 board is a 4-pin CMOS device that provides a 4-digit 7-segment display using I2C bus. There are no external components required. Only two signal lines SDA and SCL plus supply voltage and ground are required to be connected. 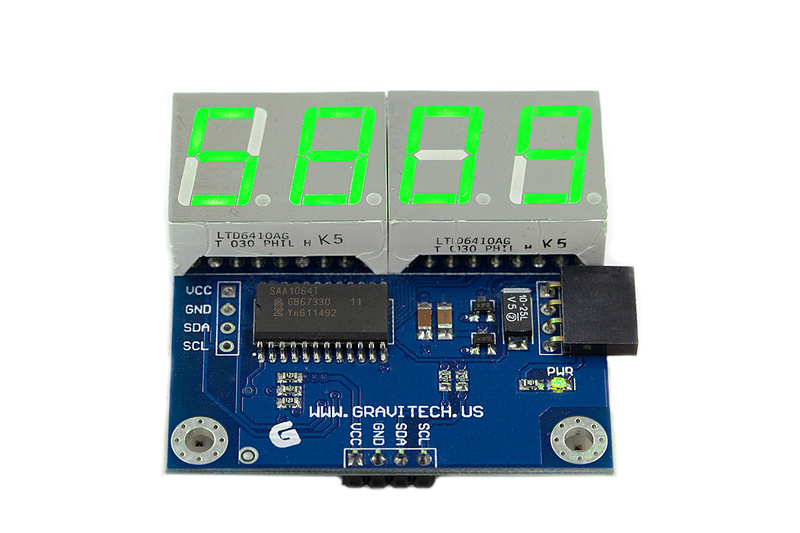 This makes it perfect for embedded systems that require LED display. 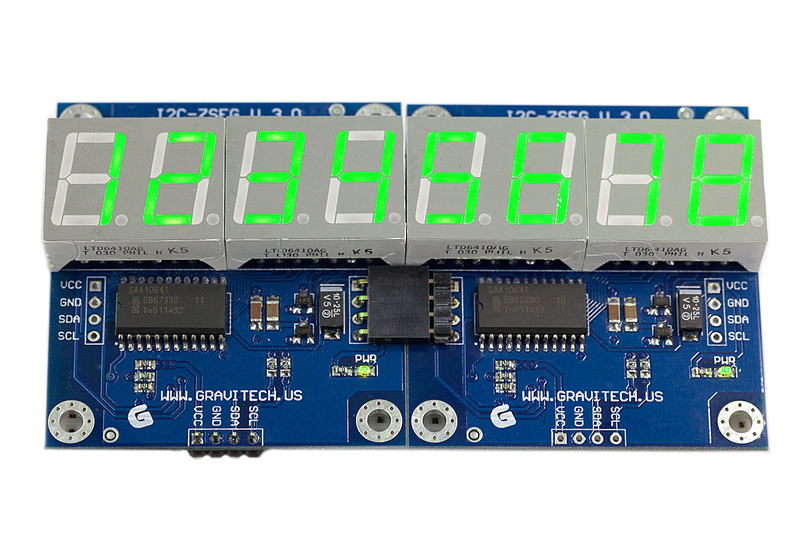 This board features innovations that set it apart from other 7-segment modules. Innovations like on-board I2C address jumpers, pull-up resistors, and power LED. This board is breadboard compatible. The board measures a tiny 2.00 x 2.10 inches. There are 4 convenient mounting holes, each 0.13 inches in diameter and centered 0.15 inches from each corner. The I2C-7SEG-V3 is based on the SAA1064T IC. The circuit is designed to drive four 7-segment LED displays, with decimal point, by multiplexing between two pairs of digits. 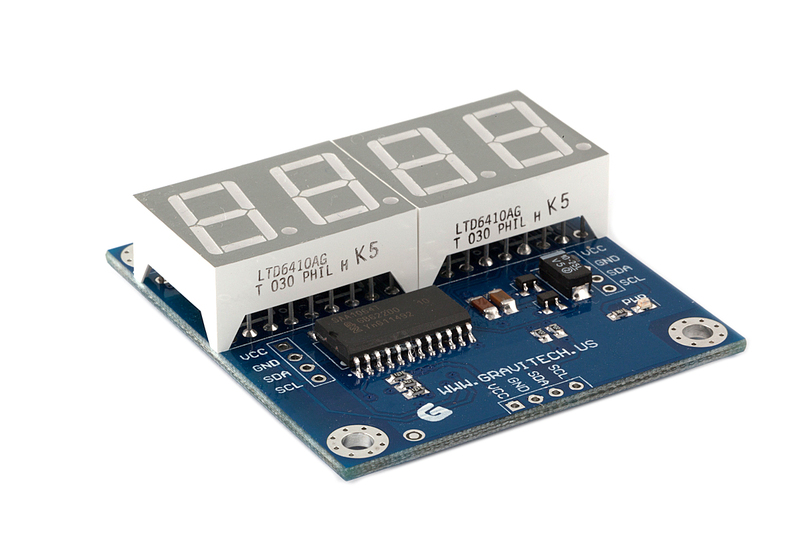 It features an I2C bus slave transceiver interface with the ability to program 4 different slave addresses. Features a power reset flag; 16 current sinking outputs, controllable by software up to 21mA; two multiplex drive outputs for common anode segments; an on-chip multiplex oscillator; control bits to select between static, dynamic, and blank mode; also uses one bit for segment tests. Four of these slave devices may be used on the same bus. • Flicker free multiplexed 7-segment display (x4). • Complete control over each individual segment of each display. • No need for continuous refresh loops. • Completely encapsulated module, no additional components required. • On board I2C address jumpers. • On board power LED. • Decoupled from supply voltage. • Engineered to be used with breadboards. • High quality, double sided PCB. 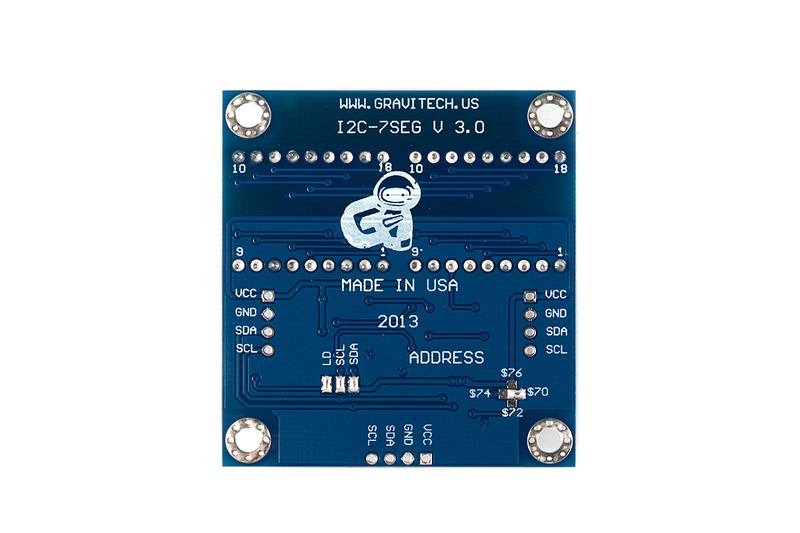 • PCB is an attractive blue color, with silkscreen reference indicators easily legible. • All control components are SMT devices. • 3 sets of conveniently placed header pins - 0.4" wide, 0.1" pitch. One set is included for single slave mode. Two others are provided for the optional chaining of up to four devices on the same bus. • Flexible power supply requirements: 4.5V - 15V. 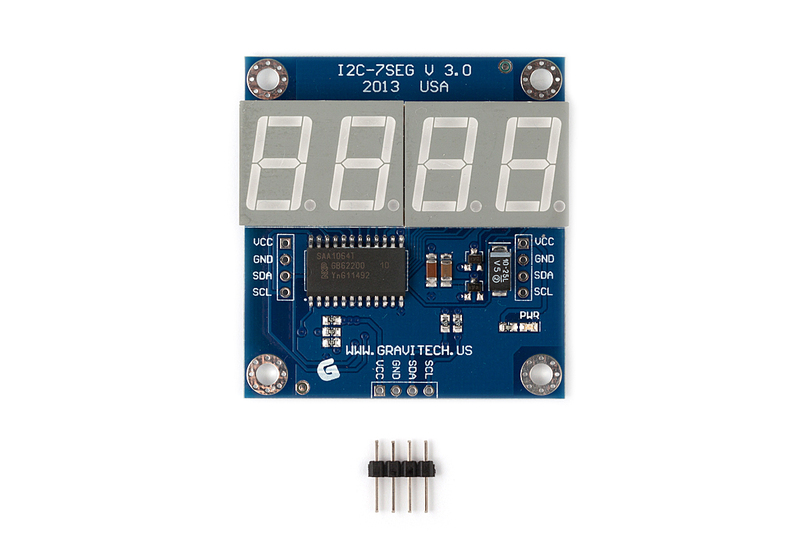 • Works with 5.0V micro-controllers with no modification. • Come with 4-PIN male header ready to use (see first picture below).